Long before the creation of Canada Dry and other sugar-laden soft drink versions of ginger ale, people used to make and drink real ginger ale for its refreshing taste and health benefits. Real ginger ale is made with…you guessed it, real ginger! And ginger has long been used by Asian cultures to treat and prevent a variety of physical ailments. In the practice of traditional Chinese medicine, ginger is often prescribed to decrease intestinal gas production and to relax the smooth muscles that line the digestive tract. Double-blind studies have found ginger to be effective in decreasing symptoms of motion sickness, particularly sea sickness. More specifically, intake of ginger has been shown to decrease feelings of dizziness, nausea, vomiting, and the production of cold sweats. One study even found ginger to be more effective than Dramamine, a drug that is often used to treat symptoms of motion sickness. A large-scale study that was published in the April 2005 issue of Obstetrics and Gynecology found that ginger can effectively decrease nausea and vomiting during pregnancy, even in severe cases where strong anti-vomiting drugs are normally prescribed. As was to be expected, there were no adverse or “side” effects reported with pregnancy outcomes due to ginger intake. Contrast this with the risk of birth defects that is associated with taking anti-vomiting drugs, and it’s really a no-brainer for all pregnant women who experience intolerable nausea and vomiting to try taking small amounts of ginger before resorting to conventional drug-based treatments. 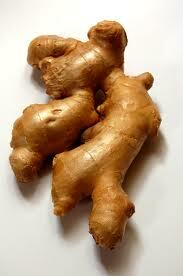 Real ginger is abundant in natural compounds called gingerols, which have strong anti-inflammatory properties. Numerous clinical studies have found that ginger can provide significant pain relief to people who suffer with degenerative or rheumatoid arthritis and/or chronic pain in their muscles. Research presented at the Frontiers in Cancer Prevention Research meeting in Phoenix, Arizona in October of 2003 suggests that gingerols found in real ginger may inhibit the growth of cancer cells in the colon. Research findings presented at the 97th Annual Meeting of the American Association for Cancer showed that gingerols are actually able to kill ovarian cancer cells. Because ginger is so concentrated with gingerols and other beneficial nutrients, a small amount goes a long way. Ginger tea made by steeping a 1/2-inch slice of fresh ginger in a mug of hot water is usually enough to sooth an irritated digestive tract. For arthritis-related pain, eating even a quarter inch slice of fresh ginger with food or freshly pressed juices can provide significant relief. You should aim to choose fresh ginger over dried ginger whenever possible, as fresh ginger is more flavorful and contains higher levels of beneficial nutrients. Fresh ginger can be found in most food markets in the produce section. Look for roots that are firm and free of mold. You can peel the skin with a knife, a potato peeler, or even the edge of a spoon. Push ginger root, tangerine, grapes, and watermelon through a juicer. Add mineral water to juice and stir well. If you use a strong blender in place of the juicer, use some of the sparkling mineral water to get the ingredients going and add the remaining water once the ingredients are blended together. Depending on the strength of your blender, you may need to use a strainer if you prefer a clear ginger ale. Because this recipe for natural ginger ale calls for quite a bit of fruit juice, it’s best to have it only occasionally. If you have trouble maintaining a healthy blood sugar level, you can juice a 1/4 slice of fresh ginger root with six leaves of romaine lettuce, 3 ribs of celery, and 2 carrots for a ginger-flavored green vegetable drink. Wigler I, Grotto I, Caspi D, Yaron M. The effects of Zintona EC (a ginger extract) on symptomatic gonarthritis. Osteoarthritis Cartilage. 2003 Nov;11(11):783-9.